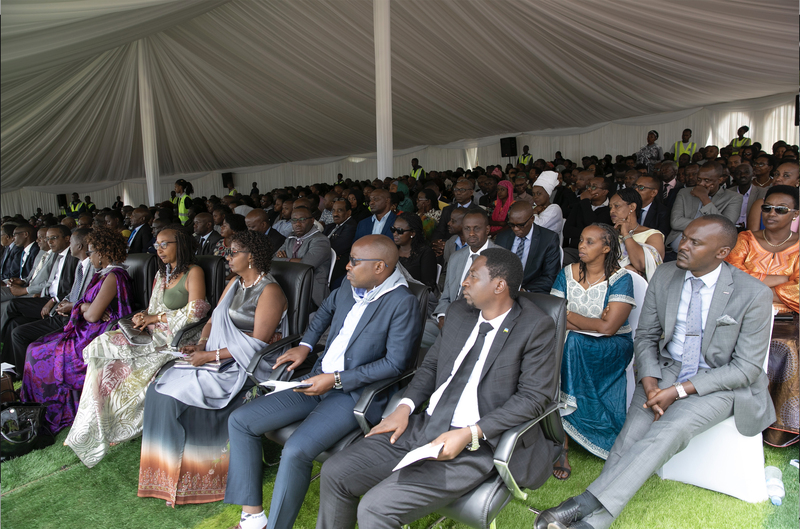 Kigali, 13 April 2019 – The official Commemoration Week was concluded today with an event to honour politicians who opposed the genocidal plan and paid the ultimate price for defiance. The event took place in Kigali at Rebero Genocide Memorial, which serves as the final resting place for over 14,000 victims of the Genocide against Tutsi and 12 politicians who were killed for standing against the genocidal government in 1994. President of Senate Bernard Makuza was joined by Christine Mukabunani, the representative of National Forum of Political Organisations, Amb John Mwangemi, Dean of Diplomatic corps, Justice Minister Johnson Busingye, Executive Secretary of CNLG, Dr Jean Damascene Bizimana, Ibuka Association President, Prof Jean Pierre Dusingizemungu, and families of the victims in laying wreath on the graves of the 12 politicians and the common burial place for over 14,000 victims of the Genocide. In her address Hon. Christine Mukabunani, representative of the National Forum of Political Organisations said that remembering politicians who stood for the truth was an occasion for all Rwandan politicians to renew their commitment to rebuilding the nation and promote good governance. In his presentation on the role of the bad politics in the Genocide, Dr Jean Damascene Bizimana demonstrated how the genocidal government led by the ruling party, MRND, used all strategies including meetings and written documents in opposing the Arusha negotiations while mobilising the public for their plan to exterminate the Tutsis. Senate President, Bernard Makuza reminded participants that the Genocide was prepared and implemented by the government. “It is a fact that Genocide cannot be possible without the support of the government. The facts about the government’s involvement in the Genocide against the Tutsi are undeniable. They are everywhere – in testimonies, ICTR judgments” Hon. Makuza said. Hon. Makuza further noted Rwanda’s impressive recovery 25 years after the Genocide. “After the Genocide, everything was a priority. The government had to restore unity among Rwandans rebuild people’s trust. Good governance was the way to go, and a number of homegrown solutions were adopted to address the country’s challenges. The constitution with the principles of equal rights for all was adopted, while Gacaca courts were established to bring justice” Hon Makuza said. The President of Senate further asked the International Community to stand with Rwanda in the continued battle for justice and against genocide ideology and denial. “Rwanda is still a member of the International community though it abandoned us. We are committed to giving our contribution to bringing needed changes, especially in preventing genocide and fighting denial. There have been different resolutions about fighting Genocide denial& providing justice to survivors but only a few countries have implemented them. If the international community really acknowledged its failure, it should adopt& implement these resolutions. We commend the countries that have demonstrated a political will by enacting laws against genocide denial. We encourage others to follow the suit” Hon Makuza said. Although the national Mourning Week concludes today, Kwibuka25 activities will continue until 4 July 2017 – the date Rwanda was liberated from the genocidal regime by then Rwandan Patriotic Army (RPA). The former President of the Constitutional Court, Joseph Kavaruganda, is also buried at the memorial. Former Prime Minister, Agathe Uwilingiyimana, is buried at the National Heroes Mausoleum at Remera and was also honoured today. In 1994, Rebero served as a refugee for those who had survived the killings at Nyanza-Kicukiro. This was after the RPA troops had captured the strategic hill of Rebero in order to fight genocidal forces. The survivors were relocated after a few days due to intense fighting in the area.